Unassuming in plot and style, "Heidi" may well rank as a world classic. Both background and characters ring true. The air of the Alps is wafted to us in every page; the house among the pines, the meadows, and the eagle poised above the naked rocks form a picture that no one could willingly forget. And the people, from the kindly towns-folk to the quaint and touching peasant types, are as real as any representation of human nature need be. Every goat even, has its personality. As for the little heroine, she is a blessing not only to everyone in the story, but to everyone who reads it. The author, Johanna Spyri, so entirely lost herself in her creation that we may pass over her career rather rapidly. She was born in Switzerland in 1829, of a literary family, and devoted all her talent to the writing of books for and about children. Heidi was originally written in German. The translator of this version was born and reared in a region closely similar to that of the story. Her home was originally in the picturesque town of Salzburg, and her father, Franz von Pausinger, was one of the greatest landscape painters of his country and generation. Another equally important requisite is knowledge of children. It happens that this translator has a daughter just the age of the heroine, who moreover loves to dress in Tyrolese costume. 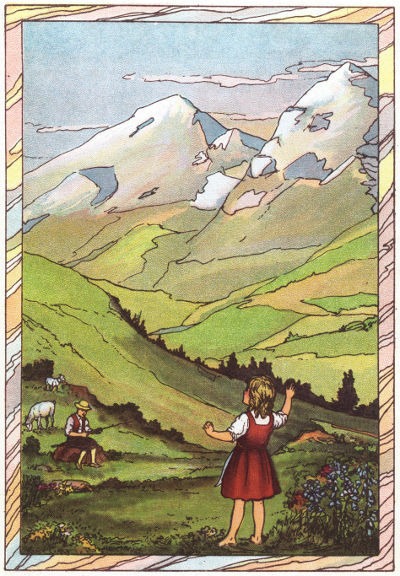 To translate "Heidi" was for her therefore a labor of love. The phrasing has also been carefully adapted to the purpose of reading aloud—a thing that few translators think of. In conclusion, the author, realizing the difference between the two languages, has endeavored to write the story afresh, as Johanna Spyri would have written it had English been her native tongue. How successful the attempt has been the reader will judge.